Many of you know the work of the EndBrainCancer Initiative (formerly the Chris Elliott Fund) and are familiar with our very active one-on-one personalized “Direct Connect” services which include access to specialists, novel treatment options, and a plethora of clinical trials. In addition, you are likely aware of our large, ever-evolving Education, Awareness, & Outreach Programs; however, it is our “Advocacy” programs that I want to share about today. The word “Advocacy” is a big word and can mean just about anything you want to apply it to. Today, I am using the word “Advocacy” to refer to my work as it relates to clinical trial development for GBM and rGBM patients. 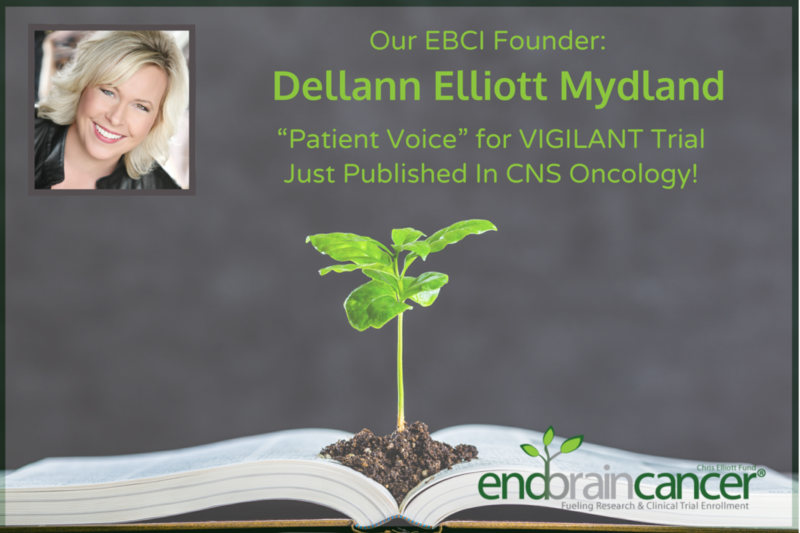 For the past year and half, I have been on the VIGILANT Steering Committee providing a “Patient Voice” for the VIGILANT Trial. I am proud to announce that this work has just been published in CNS Oncology and is now available to read here on Future Medicine. I am also proud to tell you that EBCI and I are currently working on the development of two more clinical trials for brain cancer patients. By design, most of you are not actually aware of our “Advocacy” programs. The EndBrainCancer Initiative (EBCI) and I work consistently and quietly, behind the scenes, on multiple “Advocacy Projects” with Improved Patient Outcomes at the forefront of our involvement. Most are not aware of this Advocacy work simply because much of it is confidential until published. Our Advocacy work takes years to put into place as it relates to new studies, clinical trials, practice and policy (including “reimbursement” and proper insurance/Medicare/Medicaid coding). In addition, much of our work related to IMMEDIATE ACCESS to treatment modalities is through actively testifying to the FDA for the approval of new and developing treatments. Although the EBCI and I have gone about our advocacy work fairly quietly and consistently…and much has been accomplished; there is so much more to do. Why are we quiet about our Patient Advocacy work? Because we are incredibly busy providing daily service to the Brain Tumor Community via our “Direct Connect” and Education, Awareness, & Outreach Programs. Both programs are only funded at 50% of what is needed in order to supplement with another “Direct Connect” Patient Liaison and a full time nurse. This means that the demand for our services and day-to-day work is extremely high and leaves very little time to bring attention to any of our behind the scenes work. As we prepare to launch our Year End and Annual Appeal, please give some thought to how YOU could help the EBCI provide HOPE for more brain cancer patients by getting them into top brain cancer specialists and helping us provide the appropriate staffing needed to pre-qualify them for clinical trials. You have the power to improve patient outcomes! Please consider making a gift today in order to support our daily work, our mission, our ability to keep the “Direct Connect” Center open & staffed, to keep patient services 100% free, and to help us to bring more clinical trials to brain cancer patients. Click here to make this life changing gift today!